For other ships with the same name, see USS Yorktown. Motto: "Victory is our tradition"
Status: Stricken, to be disposed of. In reserve at the Naval Inactive Ship Maintenance Facility, Philadelphia, Pennsylvania. USS Yorktown (DDG-48/CG-48) was a Ticonderoga-class cruiser in the United States Navy from 1984 to 2004, named for the American Revolutionary War Battle of Yorktown. Yorktown was launched 17 January 1983 and was sponsored by Mrs. Mary Matthews, widow of Nick Matthews, a prominent citizen of Yorktown, Virginia. Yorktown was commissioned on 4 July 1984 at Yorktown, Virginia, and was designed to take advantage of the American Aegis technology. Among its various weapon systems were surface to air missiles (SAMs), anti-ship/anti-submarine missiles, torpedo launchers, and a mounted cannon. Yorktown's first deployment was from August 1985 to April 1986 and, among other things, involved the Achille Lauro hijacker intercept, two Black Sea excursions (in 1986 and 1988), and a trio of operations off the Libyan coast including Operation El Dorado Canyon and Operation Attain Document and Prairie Fire. The Soviet Burevestnik M-class frigate Bezzavetnyy intentionally hit Yorktown in 1988. Yorktown received the Atlantic Fleet's "Top Gun" award for outstanding naval gunfire support in 1987. During the second deployment from September 1987 to March 1988, Yorktown participated in numerous U.S. and NATO exercises, as well as multi-national exercises with Morocco, France, West Germany, Tunisia, and Turkey. It was on this Mediterranean deployment that Yorktown gained worldwide publicity from operations conducted in the Black Sea as part of Freedom of Navigation program. On 12 February 1988, while Yorktown was exercising the "right of innocent passage" through Soviet territorial waters, the Soviet Burevestnik-class frigate Bezzavetnyy (Russian: Беззаветный) intentionally collided with Yorktown with the intention of pushing her out of Soviet territorial waters. The Assistant Secretary of Defense for International Security Affairs at the time, Richard L. Armitage, acknowledged that the transit was not operationally necessary, but asserted that it was still a valid innocent passage under international law. Yorktown conducted her third and fourth Mediterranean deployments as the world watched the end of the Cold War and the coalition victory in Operation Desert Storm. During the latter of these two deployments Yorktown participated in the first U.S. military exercises with the Romanian and Bulgarian navies, and played a key role in Operation Provide Comfort, which provided humanitarian relief and security for the Kurdish refugees in northern Iraq. In the summer of 1992, Yorktown participated in BALTOPS '92. 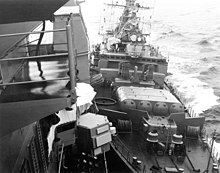 During this cruise, Yorktown made a highly acclaimed port visit to Severomorsk, Russia, becoming the first U.S. ship to visit that port since the end of World War II. Yorktown served as Flagship for Commander, Task Group 4.1, during counter-drug operations in the Caribbean in May - July 1993. In August 1993, Yorktown participated in the joint military exercise Solid Stance in the North Atlantic. Yorktown's operations through the end of 1993 included an October - November excursion to the Caribbean to support the United Nations embargo of Haiti. In April - May 1994, Yorktown returned to the Caribbean as Force Air Warfare Commander during joint Exercise Agile Provider. While in the Caribbean, Yorktown served as flagship for Commander, Destroyer Squadron Six, coordinating a six-ship, twenty-six missile exercise. In the summer of 1994, Yorktown achieved a resounding score of 101 during naval gunfire support qualification. In August 1994 Yorktown set sail for the Adriatic Sea as flagship for Commander, Standing Naval Forces Atlantic in support of the United Nations embargo of the Federal Republic of Yugoslavia. During this six-month deployment, Yorktown served as the Air Warfare Commander for the Adriatic Sea, participating in a joint task force of ships from the United States and eight European nations. In May - June 1995, Yorktown proceeded south to serve as Air Warfare Commander for the Caribbean Sea in support of counter-narcotics operations. In May 1997 Yorktown (with a reduced crew aboard) completed a five-month counter-narcotic deployment in the Caribbean followed by test operations with George Washington and her carrier battle group. During these periods Navy Manpower and Analysis Center (NAVMAC) conducted a detailed review of manpower requirements, and Operational Test and Evaluation Force (OPTEVFOR) verified the ship's ability to meet all required operational capabilities in the projected operating environment doctrine for Ticonderoga-class cruisers. On 21 September 1997, a division by zero error on board the USS Yorktown (CG-48) Remote Data Base Manager brought down all the machines on the network, causing the ship's propulsion system to fail. On 25 September 1999 Yorktown departed Pascagoula for a four-month counter-narcotic deployment in the Caribbean. Before beginning patrolling efforts, Yorktown embarked staff members from COMSECONDFLT. Supported by the helicopter detachment, the Second Fleet staff surveyed and photographed another island slated as a potential replacement for training exercises if the Navy was unable to continue at Vieques Island, Puerto Rico. The ship made port calls in Jamaica, Aruba, Cartagena, Rodman, Manta and Cozumel. During this deployment the USS Yorktown was the last US warship to transit the Panama Canal prior to it being turned over to Panama. As of 2001[update], and since commissioning, Yorktown had completed five Mediterranean deployments. The cruiser was last homeported in Pascagoula, Mississippi. Her last deployment (Feb 2004-Aug 2004) was as part of the WASP ESG-2 (Expeditionary Strike Group 2) to the 5th Fleet AOR. She patrolled the Persian Gulf providing security for the Iraqi oil terminals and conducting maritime security operations. Yorktown was decommissioned and struck on 10 December 2004. As of 2008, Yorktown was scheduled to be dismantled in the next five years along with her sisterships Vincennes and Thomas S. Gates. Since her decommissioning, Yorktown has been berthed at the Naval Inactive Ships Maintenance Facility, Philadelphia, Pennsylvania. As of September 2016, the ship remained in Philadelphia. ex-Yorktown (CG-48), along with sister ships ex-Ticonderoga (CG-47) and ex-Thomas S. Gates (CG-51) laid up at Naval Inactive Ships Maintenance Facility, Philadelphia, Pennsylvania. From 1996 Yorktown was used as the testbed for the Navy's Smart Ship program. The ship was equipped with a network of 27 dual 200 MHz Pentium Pro-based machines running Windows NT 4.0 communicating over fiber-optic cable with a Pentium Pro-based server. This network was responsible for running the integrated control center on the bridge, monitoring condition assessment, damage control, machinery control and fuel control, monitoring the engines and navigating the ship. This system was predicted to save $2.8 million per year by reducing the ship's complement by 10%. On 21 September 1997, while on maneuvers off the coast of Cape Charles, Virginia, a crew member entered a zero into a database field causing an attempted division by zero in the ship's Remote Data Base Manager, resulting in a buffer overflow which brought down all the machines on the network, causing the ship's propulsion system to fail. Anthony DiGiorgio, a civilian contractor with a 26-year history of working on Navy control systems, reported in 1998 that Yorktown had to be towed back to Norfolk Naval Station. Ron Redman, a deputy technical director with the Aegis Program Executive Office, backed up this claim, suggesting that such system failures had required Yorktown to be towed back to port several times. In the 3 August 1998 issue of Government Computer News, a retraction by DiGiorgio was published. He claims the reporter altered his statements, and insists that he did not claim the Yorktown was towed into Norfolk. GCN stands by its story. Atlantic Fleet officials also denied the towing, reporting that Yorktown was "dead in the water" for just 2 hours and 45 minutes. Captain Richard Rushton, commanding officer of Yorktown at the time of the incident, also denied that the ship had to be towed back to port, stating that the ship returned under its own power. Atlantic Fleet officials acknowledged that the Yorktown experienced what they termed "an engineering local area network casualty". "We are putting equipment in the engine room that we cannot maintain and, when it fails, results in a critical failure," DiGiorgio said. Criticism of operating system choice ensued. Ron Redman, deputy technical director of the Fleet Introduction Division of the Aegis Program Executive Office, said that there have been numerous software failures associated with NT aboard the Yorktown. Because of politics, some things are being forced on us that without political pressure we might not do, like Windows NT. If it were up to me I probably would not have used Windows NT in this particular application ... Refining that is an ongoing process ... Unix is a better system for control of equipment and machinery, whereas NT is a better system for the transfer of information and data. NT has never been fully refined and there are times when we have had shutdowns that resulted from NT. This page is based on the Wikipedia article USS Yorktown (CG-48); it is used under the Creative Commons Attribution-ShareAlike 3.0 Unported License (CC-BY-SA). You may redistribute it, verbatim or modified, providing that you comply with the terms of the CC-BY-SA.